As you can see, thousands of tiny little flowers adorn each bush of Manchurian Baby's Breath! Since we seem to always have problems growing Gypsophylla paniculata, the standard Baby's Breath, we started experimenting with other species that might give us the dried flower we wanted with less hassle. That's when we discovered this reputedly medicinal version of Gypsophylla. It grew so well for us, that we decided to offer only this variety. Now we have lots of dried Baby's Breath for our bouquets. Baby's Breath likes full sun and excellent drainage. Bloom starts in mid summer and continues until frost. Flowers should be harvested before any browning occurs. The bush will die back to the ground in most climates but will return in spring in the appropriate zones. Dead branches should be removed before new spring growth gets too large. It is much easier to whack the old stems off if you don't have to worry about cutting off the new ones. Flower sprays can be dried in a fresh arrangement or wreath or hung upside down in small batches to dry for later use. Baby's Breath looks great with just about all other plants. But, it does get quite large so give it plenty of room to spread its flowers out. 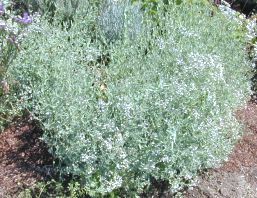 Try planting it in the garden with Purple Statice, Tricolor Sage, Roses of any kind, and pink flowering ornamental Oreganos like Showy Pink Oregano. 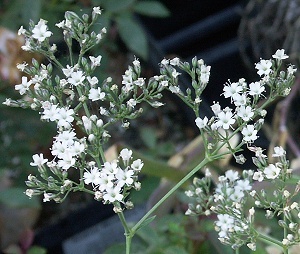 Manchurian Baby's Breath is one of six plants chosen for our Zone 8-11 Crafter's Herb Garden Six Pack. This plant is often available in plug trays. These trays hold 128 of all the same plant. They are a great low cost way to fill a lot of space. Each cell is 3/4 of inch by an inch. Check here to see if Manchurian Baby's Breath Plug Trays are available.